World Breastfeeding Week Celebration 2010 Join Malaysia’s Mothers in 1 MINUTE SIMULTANEOUS BREASTFEEDING. Malaysia’s Mothers join together to breastfeed their babies for one minute at the same time. Bring your families to enjoy our song and dance performances and learn about your rights to successfully breastfeed your baby. This year’s event will be at DISTED College 340 Macalister Road, Penang on Saturday 7th August 2010 from 3:00pm till 5.30pm. If you are not in PENANG on 7th August …no worries…..YOU CAN STILL PARTICIPATE!!! You can participate from wherever you are – at home, in the office, at the mall, anywhere!! 1) On Saturday 7th August, at about 3:15 p.m. prepare yourself and the baby or babies if tandem breastfeeding, you can even begin Breastfeeding at this time and continue to do so till 3:30 p.m. and continue even after 3:30 p.m. according to your baby’s convenience. However, it is very important that you are breastfeeding your baby at exactly 3:30 p.m., because this is when all the mothers in Malaysia in their homes, offices, hospitals and at our event venue will be breastfeeding. 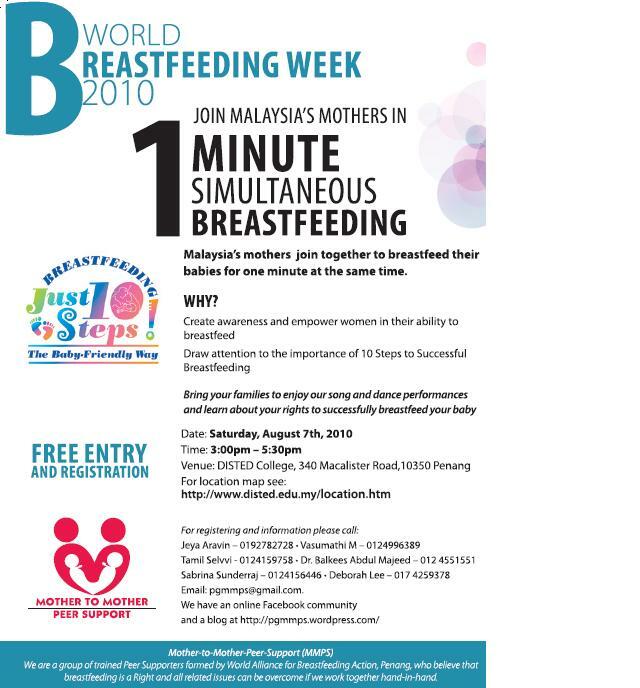 We will need this information to send you a Certificate that you can proudly display and let the world know that you joined Malaysia’s mothers in support of Breastfeeding. Wonderful initiative to spread the awareness of breastfeeding. The event has been updated on Mummy’s Reviews™’ Facebook page.